The flag was adopted in 2002. It is the same as the flag originally adopted when the country declared its independence from Portugal in 1975, nine days before being invaded by Indonesia. At midnight on 19 May 2002, and during the first moments of Independence Day the next day, the United Nations flag was lowered and the flag of an independent East Timor was raised. 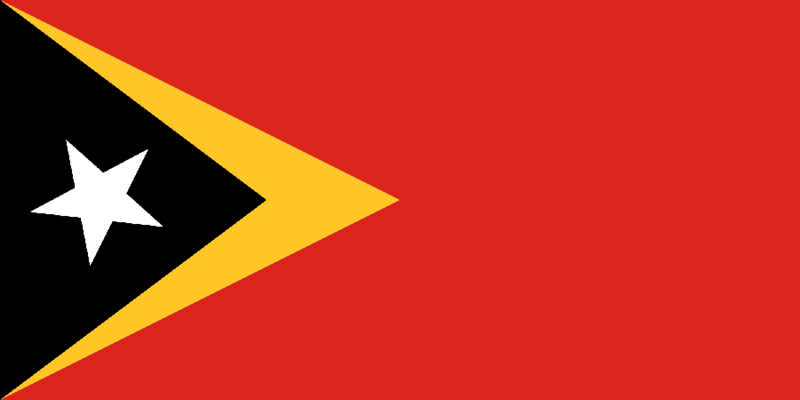 As per the Constitution of East Timor, the yellow (PMS 123) triangle represents “the traces of colonialism in East Timor’s history”. The black triangle represents “the obscurantism that needs to be overcome”; the red (PMS 485) base of the flag represents “the struggle for national liberation”; the star, or “the light that guides”, is white to represent peace.